The queen and I are grieved to hear of the sad demise of Herbert Armstrong. He was a man truly dedicated to the cause of serving humanity. May his soul rest in peace. education and industry around the world. At his death, dignitaries showered God's Church with condolences paying tribute to Christ's apostle. Long-time ministers and leaders within God's Church also offered personal glimpses into how their lives were affected by Mr. Armstrong and what it was like to work with him. Here, through the eyes of many of those who best knew him, is a retrospective look at the memories and messages left by Herbert W. Armstrong. We have included as many condolences and reminiscences as space allows us to print in this issue of The Good News. Mr. Armstrong's whole life was sharply focused around one thing — the Work of God. He lived, ate, slept and breathed Christ's commission to the Church. All his conversations and discussions were either directly about or soon got around to God's plan, the Gospel, the Church, the Work or the Bible. The joy of his life was doing the will of God. And he carried right on doing it until the end of his long and eventful life. I have often been asked, "How was Mr. Armstrong received?" For those who already had met him the reception was warm and often affectionate. To those meeting him for the first time, they quickly saw him as a man of understanding and wisdom. As Mr. Armstrong would say, "It makes sense, and it is the only explanation that does." Although they often didn't want to admit it, and didn't believe it would happen, the Gospel was given as a witness to them. It was clear that God was guiding him in what to say. I was greatly saddened to learn of the passing away of Mr. Armstrong. From the time of the San Francisco Conference which he attended as a journalist, Mr. Armstrong took a strong and supporting interest in the United Nations. With his wide ties throughout the world, he pursued the cause of peace and harmony among all peoples. Grieved and shocked to learn — the passing away of Mr. Herbert Armstrong, chairman of Ambassador Foundation, a good friend to the Chinese people. His contribution to mutual understanding and friendship between the peoples of China and the United States will remain forever in our hearts. Please convey my condolences to his family and relatives. Their majesties instructed me to convey their heartfelt sympathies and condolences on the passing away of Mr. Herbert W. Armstrong and their hope that the life of benevolence, altruism and the drive for better understanding among peoples which Mr. Armstrong led will continue to be the inspirational path for others to follow. The queen and I have learnt with deep sorrow and profound sadness the news of the passing away of Mr. Herbert W. Armstrong, the founder and chairman of Ambassador Foundation who, through his understanding, wisdom and humanitarianism, has sought to give encouragemen t and assistance to people all over the world, particularly to Thailand where he has devoted much of his time and resources thereby becoming a close and valuable friend of our country. We hasten to express to the members of Mr. Armstrong's family, his colleagues at the Ambassador Foundation and Ambassador College our sincere sympathy and heartfelt condolences for this. sad and irreparable loss, which will be felt not only in the United States of America but also in Thailand. I am deeply saddened to hear of the passing away of Mr. Herbert W. Armstrong. He was a great master who preached for world peace, and who sacrificed his life and wealth to further the cause of bringing ever-lasting peace to this world. The students, staff and administration of our institute in Mt. Lavinia, Sri Lanka, wish to convey their regret at the loss of this loving man. Please accept our condolences upon the death of our neighbor and your leader. His long and productive life leaves a lasting benefit for many. The one reason Jesus Christ could use Mr. Armstrong as an apostle in this century was that he never wanted to be an apostle — even though his ordination papers said he was ordained to that office. Over the years Mr. Armstrong not only came to understand Church government but also learned to live it. Please accept my belated but sincere expression of condolence in the passing of Dr. Herbert W. Armstrong. His loss will be felt by all those who shared in his tireless dedication toward world peace and especially by those whose lives have been enriched by the outstanding cultural programs presenting world renowned artists at Ambassador College over the past many years. To the congregation, Worldwide Church of God: Nancy and I join all those mourning the loss of Herbert W. Armstrong. As founder and leader of the Worldwide Church of God, Mr. Armstrong contributed to sharing the word of the Lord with his community and with people throughout the nation. You can take pride in his legacy. Very saddened to hear of the death of Herbert Armstrong, a tireless worker for the brotherhood of man and an inspiring religious and public and educational personality, whom Israel regarded as a true friend. Deeply shocked by news of the death of unforgettable Herbert W. Armstrong. Am with you all in prayers and hopes for successful continuation of his life's work. Mr. Armstrong set the college on the proper course from the beginning. He dared to make Ambassador different — a unique institution of higher learning in a world where the missing dimension in education had been sadly neglected. Members of the Royal Thai Embassy's staff join me in sending our deepest sympathy and heartfelt condolences to the Armstrong family on the passing away of Mr. Herbert Armstrong, a great friend of Thailand and a truly fine human being. It was a privilege to have known and worked with Mr. Armstrong and we will always be thankful for the fine efforts and contributions that Mr. Armstrong has made to the betterment of understanding and friendship between the peoples of Thailand and the United States. As a very longtime friend of Mr. Armstrong I send my sincere condolences to you and the entire Worldwide Church of God. Mr. Armstrong and I first met in 1939 or 1940 (neither of us could ever pinpoint the exact date) and from that time until now we enjoyed a warm and trusting friendship. As you and the members know, one of Mr. Armstrong's finest traits was his loyalty. Add to that his love of perfection in everything he came in contact with. His was a life lived fully and unselfishly — truly God's servant in every way. I consider his passing as a great personal loss and my memories of our many years together will never grow dim. I wish you every success in the challenging years ahead. May God guide you and richly bless you. Mr. Armstrong wasn't interested in what Herbert Armstrong wanted in the publications — he was interested in what God wanted in the publications. And he insisted that every headline, every article, every advertisement bring this world a little closer to God's Kingdom. A Man Like No Other Herbert W. Armstrong often used the word unique in his speaking and writing. Thirty years ago, when I first met him, I heard him use that word several times. In his unique way of expressing his thoughts, he would not even hesitate to use the phrase "most unique." But why? Perhaps one of the reasons was that he himself was unique — or rather, "most unique"! Just about everything he taught and wrote — the way he conveyed his ideas and thoughts — everything about Herbert W. Armstrong was unique. But above all, the message he boldly proclaimed to the world for several decades certainly was — and still is — "most unique." Herbert W. Armstrong knew how to capture people's attention. You could not help but listen to what he had to say, whether you agreed with him or not. He challenged you to think. In his inimitable style, he made things simple and clear — plain to understand. Plain ? Yes, indeed. But I doubt whether most people had any idea what "plain" meant in Mr. Armstrong's mind. For instance, why did he give the title The Plain Truth to the magazine he started to publish more than 52 years ago — a unique magazine that today has a circulation of more than eight million copies in seven languages? Early in 1963, when he gave me the green light to undertake the publication of the French version of that magazine, he was most concerned about the exact title I would give it in French. "Do you really understand just what 'plain truth' means?" he asked. I thought I did. But I was wrong. "Well, hardly any of our readers understand it," he added. "No, I don't believe they know what 'plain truth' means." Then he sat at his typewriter and wrote almost three full pages to explain it! Thus we started, in June, 1963, the French version of the "magazine of understanding." Today La Pure Verite has a circulation of more than 300,000 copies and is read in more than 100 countries. Its subscription price — just like the price of the Good News magazine you are now reading — is unique: free for the asking. 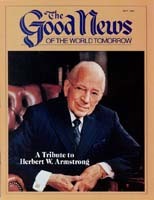 As a reader of The Good News, you undoubtedly are aware of the unique message Herbert W. Armstrong proclaimed. "The Gospel of the coming Kingdom of God has not been preached to the world by others for 19 and one-half centuries," he often said and wrote. Some listeners and readers were shocked by that bold statement. Others made fun of it. However,' no one could refute it or find him wrong. The true Gospel he proclaimed was — and still is — unique. Herbert W. Armstrong did not preach what necessarily pleased men; he preached what pleased God. Before meeting him, I myself had no idea of the true meaning of the Kingdom of God. Nor did I know what it meant to inherit the Kingdom. Like most Christians, I "believed in" Jesus Christ without understanding His message, the true Gospel. To me the return of Jesus Christ was symbolic, not literal. I couldn't see any real need for it. How wrong I was! In his last book, Mystery of the Ages, Mr. Armstrong wrote: "Present world turmoil, escalating wars and contentions will climax in world trouble so great that, unless God intervenes, no human flesh would be saved alive (Matthew 24:22). At its very climax when delay would result in blasting all life from off this planet, Jesus Christ will return" (page 305). Today, no sensible person dares to challenge Mr. Armstrong's statement that man has reached the end of his rope! Last September, Mr. Armstrong called me into his office for a private meeting. As usual his mind was focused on God's Work! He wanted to know how some of us "oldtimers" would work together if something happened to him. He sensed that he would not be with us much longer. I told him what we all had repeatedly said — that no one could ever replace him. "God is on His throne!" he said, his voice full of confidence. "Jesus Christ is the living Head of His Church!" A few days before his death, Mr. Armstrong chose Joseph W. Tkach to be his successor. What an awesome task for anyone to succeed this "most unique" individual! Mr. Tkach was very much aware of it. " God doesn't intend me to fill the shoes of Herbert W. Armstrong," said Mr. Tkach in the Ambassador Auditorium only hours after Mr. Armstrong died. "But I aim to follow in his footsteps — to follow his example." This is exactly the way all of us feel. With God's help, we shall faithfully follow in Mr. Armstrong's footsteps until the Second Coming of Jesus Christ! I want you to know that Claire and I share a great sense of loss upon the death of Herbert W. Armstrong. He was a giant of a man who provided leadership of good will and principle. From its beginning in the mid-1970s, the Ambassador Foundation provided the late Pastor General Herbert W. Armstrong with a forum to show that God's way of life is one of quality and concern for humanity. Through the foundation's projects worldwide, Mr. Armstrong aptly demonstrated that God's Church backs up its words with deeds. We were very sorry to receive the sad news of Mr. Herbert W. Armstrong's death. During the years of our association with him, all of us developed the highest regard for [his] wonderful personality and qualities. His deep devotion to the ideals of peace and justice in the spirit of the biblical prophets was appreciated by his friends in Israel. His feeling for Israel and Jerusalem was manifested in his true interest in the archaeological excavations near the temple mount and in the City of David. His name will always be attached to this most important undertaking carried out in Jerusalem. During the 24 years that I worked with Herbert W. Armstrong as he developed the Ambassador College campus at Pasadena, he taught me many valuable lessons about job attitudes, quality and resourcefulness. He never forgot that he was building important structures necessary to support the Work God gave him to do. He was always careful to see that everything was done in a manner pleasing to God, and which glorified God's name. It disgusted Mr. Armstrong to see people going about their work in a disinterested, lackadaisical, slipshod manner. He often told the old story of two men working together on a building project. When asked what they were doing, one answered indifferently, "I am laying bricks in a wall." The other answered, "I am helping to build a beautiful edifice that will serve the needs of our people and adorn this city for many generations." Mr. Armstrong wanted everyone to see the big picture. All employees soon learned that they were not just putting in hours of work for a wage, but were building a beautiful campus to the service and honor of God. New workers soon learned the phrase Ambassador quality. That meant doing the best work one could do and using top-quality materials in the most tasteful manner possible. What Ambassador quality really boils down to is the quality Mr. Armstrong asked of others and always strove to produce himself. He not only required top quality materials but he also used the best architects and builders available, and he insisted that they design and build to the peak of their abilities. I think you will agree, if you have seen "the Ambassador College campus, that those architects somehow got the message. Many of our visitors tell us that it is the most beautiful, most uplifting campus they have ever seen. Visitors always seem to notice, too, the bright, happy faces of our students, and comment on their helpfulness and their purposeful, busy lives — but that is another story, though based on obeying the same laws of the same great God. Working with Mr. Armstrong every day, I learned many valuable lessons, lessons I will always remember. With much appreciation and fondness, I will always remember Herbert W. Armstrong, too, as a man who was like a father to me. It is with great sorrow that we learned of the passing of President Herbert W. Armstrong. One could only be deeply impressed by his vast efforts to promote understanding and peace among peoples. His good deeds were felt in many corners of the world. In Jerusalem his care and concern can be seen in the many projects he undertook: the archaeological excavations uncovering the history of millennia, the children's playground and activities he helped sponsor, the dedicated work of the Ambassador College students. His visits to Jerusalem were always very special and I was privileged to share these with him. He helped foster the goals we set to ensure the future of Jerusalem, King David's city. Many people never adjust to speaking to a camera, but Mr. Armstrong knew that the camera lens represented a world that needed the message he had to deliver. That, I think, is what made him such a compelling speaker. He did not speak at his audience — he spoke to them. Mr. Armstrong made his telecast seem so natural and easy that many people do not realize how hard he had to work. Toward the end, when his vision had almost totally failed, so that he could hardly read, and the bright lights hurt his eyes, he would still find ways to overcome the problems and make the program. All of us in the studio will not forget those recording sessions. Mr. Armstrong had a way of making you want to work hard for him. His determination and courage to fulfill the commission that God gave him was a genuine inspiration to all of us. Deeply shocked and grieved at the sad report of the passing away of Dr. Armstrong. I wish to express my profound sympathy and sincere condolence to you and through you to the bereaved family. The Board of Directors of Maha Chulalongkorn Buddhist University mourns the loss of Dr. Herbert W. Armstrong who will always be remembered by us. I was saddened to learn of the death of our good friend Herbert Armstrong. It has been a great shock to members of my family and I am sure also to the numerous friends he had in Jordan. He was truly a great man of vision and his campaign for understanding and coexistence are very much valued. I am confident that his colleagues will carryon with his mission and his great work. He would often explain that he wasn't turning the world upside down. The world was already upside down, and he was turning it right side up. We deeply mourn the passing of our great friend and outstanding personality whose life was devoted to world peace, Herbert W. Armstrong. The Tucson Community Center wishes to extend its condolences to the family and congregation of Herbert W. Armstrong. It has been our privilege... to annually serve as the conference site for the Worldwide Church of God. Mr. Armstrong's presence will sadly be missed. I found him to be the most generous person I have ever known. His generosity to many people over the years has been evident. I am deeply shocked and grieved at the news of the sudden demise of Mr. Armstrong. Recalling his valuable contribution to the enhancement of cordial relations between our two countries, my colleagues and I share the deep grief of your organization and his family. Please accept my deep condolence and convey my profound sympathy to you, your organization and to his family. Shocked [to] learn [about the] unfortunate passing away of President Armstrong. Please accept my sincere condolences and convey my solicitous sympathy to his family. The late Pastor General Herbert W. Armstrong's greatest attribute, apart from his desire to do God's Work, was his clarity of vision. He had the rare ability to think far in the future and envision not only what God was leading him to do, but its ultimate outcome. Mr. Armstrong was a visionary..., He was incapable of thinking small. Those of us in the Church today are all incomparably richer for having a part in Mr. Armstrong's vision and reality of the future. He was loved. He will be missed. Of all the dozens of funerals I have attended, the one honoring Herbert W. Armstrong stood out. In a hushed but expectant — one could almost say vibrant — atmosphere, the group of about 4,700 people waited outdoors for the graveside service to begin. Suddenly, their attention was command ed by an honor guard of clean-cut young Ambassador College men marching on either side of the hearse as the body arrived at the burial site. Then came the masterful address by Herman L. Hoeh. He outlined the big picture of the Creator's dealings with mankind — from the patriarch Abraham to the congregation of Israel to the New Testament Church of God, down through the years to His servant, Mr. Armstrong. Dr. Hoeh's address set the tone of the occasion — a celebration of the magnificent life and accomplishments of a modern-day apostle, Herbert W. Armstrong. Even those outside the Worldwide Church of God were obviously inspired and moved by the remarkable atmosphere. Puzzled at first by the lack of worldly grief, they realized that the members of God's Church were grateful for the outstanding life of Mr. Armstrong, and thankful that he did not have to suffer long at the end. For the Church of God really believes in the resurrection from the dead (I Corinthians 15:22-23). We know that in a very few years — in the next split second of his consciousness — Mr. Armstrong will be resurrected in awesome glory at the Second Coming of Christ. You could almost feel the deep faith and quiet confidence in God among the Church members attending the funeral. Some visitors remarked afterward that they had never experienced anything like it. That's good. Because the atmosphere of faith and love at Mr. Armstrong's funeral gave many a tiny foretaste of the reality of the message Mr. Armstrong preached. Soon, deep within the bowels of the earth, a seismic cataclysm will begin — finally shaking every mountain and every island out of its place (Revelation 16:20). For those who will not acknowledge God, there will then be a stupendous hailstorm, with hailstones weighing up to 130 pounds (verse 21)! Finally, at the piercing blast of a trumpet, the living Jesus Christ will descend from heaven in magnificent glory, surrounded by His angelic armies, prepared to rule all nations with a rod of iron and bring about an era of true peace and joy at last. Then, millions of people from all over the earth will remember and understand. They will remember that they were told by this man, Herbert W. Armstrong, that these events were coming and that they should prepare. As final preparations for the glorious coronation ceremony of the King of kings get under way, we will all understand why the funeral ceremony of Herbert W. Armstrong, who did so much to prepare the way, was, indeed, a celebration of life. For it was life well lived. It was a life that really counted for something. It was a life keyed to the most awesome event in the long history of humanity — the Second Coming of the Son of God.